Famed Valencia Street cornerstone for sale in triple-building package. 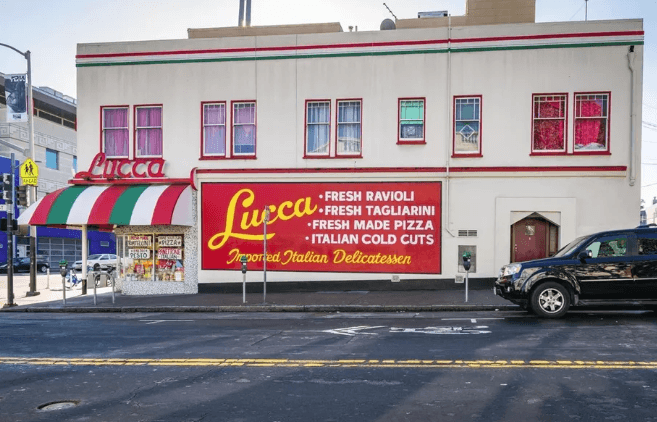 The building that for nearly a century housed Lucca Ravioli Company on Valencia Street is, as anticipated, up for sale. It’s part of a three-building package along with the two related buildings, all stuffed with a price tag of more than $8.28 million. According to to the official history of Lucca Ravioli, the Italian goods store opened its 1100 Valencia Street locale in 1925 (18 years younger than the circa-1907 building it occupies), a family owned-institution that has endured through booms, busts, world wars, depressions, and the ever-changing character of the Mission District. But as Eater SF reported in January, the neighborhood received shocking news that Lucca Ravioli will sell its last batch of tagliarini on April 20. According to the San Francisco Chronicle, no one will take over the family business once 50-year proprietor Michael Feno retires. The sale of the off-the-market building will certainly finance quite a retirement in today’s market. 1100-1118 Valencia St. is presented for sale by Jordan Geller and J.B. Williams of NAI Northern California. Click here for more details on this listing. Should California’s Costa-Hawkins rent control act be repealed?